Hanoi (VNA) – The Hanoi Department of Health is intensifying measures to reduce the number of fatalities caused by mosquito-borne dengue fever – which is likely to cause more infections due to hot and rainy weather. As of August 8, the capital city reported 13,274 dengue infections, including five deaths. 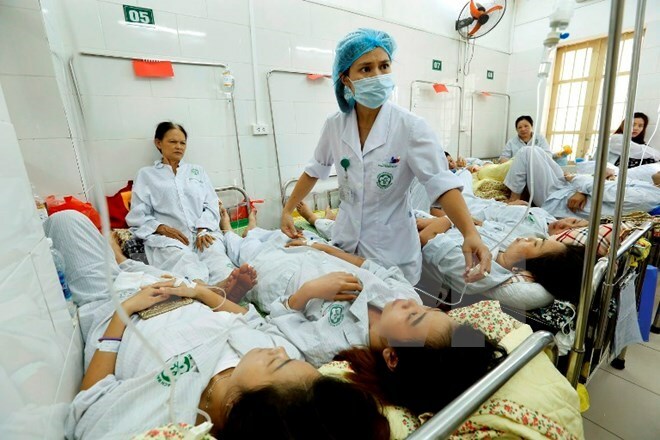 Director of the Hanoi’s Preventive Medicine Department Nguyen Nhat Cam said the fifth victim of the disease was a 36-year-old woman living in Hoang Mai. Precincts of Hoang Mai, Dong Da, Thanh Xuan, Ha Dong, Cau Giay, and Hai Ba Trung, and districts of Thanh Tri, Thanh Oai, Thuong Tin, and Hoai Duc made up 90 percent of cases. Given the risk of the disease outbreak expanding, the municipal health sector has stepped up measures to ensure the environment is hygiene, kill mosquito larva and focus on treatment of patients. The city has increased forces to prevent dengue across 269 communes and wards. From August 14 to the month’s end, the Preventive Medicine Department will spray chemical at the precincts of Dong Da and Hai Ba Trung, and some wards in Ba Dinh, and Hoan Kiem.